Grilled leeks are grown-up versions of grilled scallions, also known as cebollitas asadas - a favorite in Mexican cuisine. A favorite because they go so well with grilled meats of all sorts. 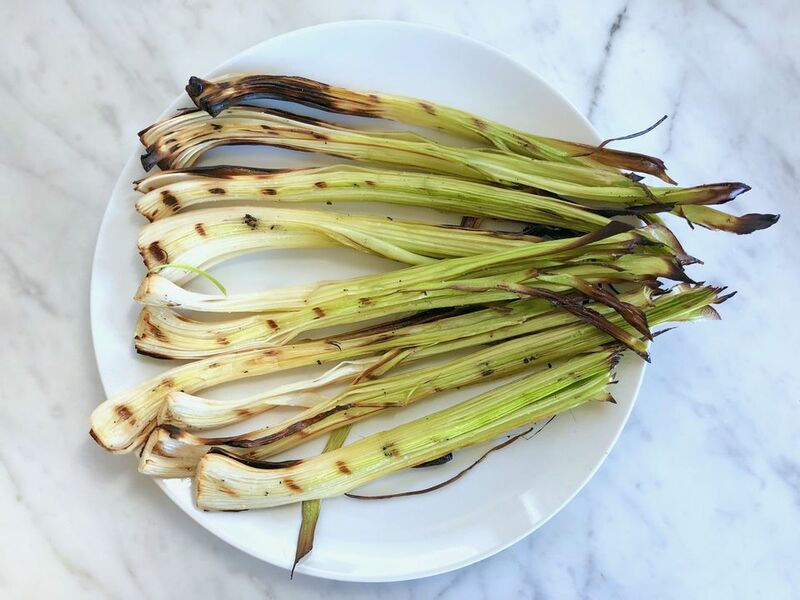 While grilling works best with young, thin leeks, if you're willing to add an extra step of blanching, or quickly boiling, larger leeks, they can be made tender enough to enjoy on the grill as well. Whatever size you use, look for fresh leeks without browning roots or wilted leaves. 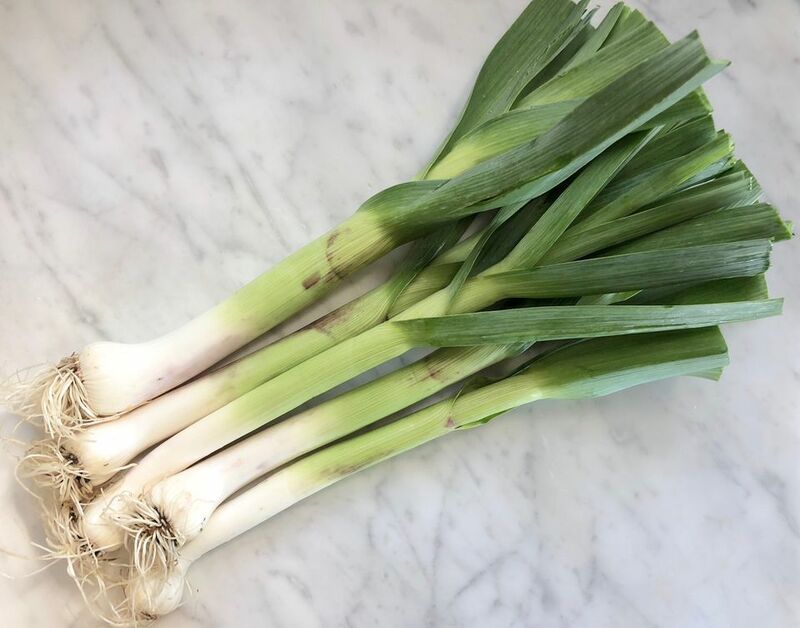 While you want to trim off and discard the root end, you only want to cut off as much as you have to, leaving enough of the end of the leek there so the whole thing holds together. Trim judiciously! The darker green parts of the leaves on leeks are tougher and they're tricky to get tender on the grill. Trim them off. You can either discard them or use them for other cooking purposes. They are delicious as an aromatic in broth or sautéed in a stir-fry. Pull off and discard the tough, outer leaf or two of each leek. This step takes care of any external bumps or bruises the leek may have, and also removes the toughest part to get tender out of the way. Important note: If you're using larger or thicker leeks, or if you simply like your leeks super tender, this is when you'll want to blanch them. Bring a large pot of salted water to a boil, add the leeks, and cook until knife tender, 3 to 5 minutes. Drain and dunk in ice water to cool them off. Pat dry and proceed. Use a sharp knife to cut the leeks in half lengthwise. Gently fan the leaves apart to look for dirt or grit. If you're unlucky enough to have leeks with dirt in between the layers (you'll see it if it's there! ), rinse the leeks under cold running water to remove any dirt or grit. Push the leaves back into as much of a connected stack as you can. Then drizzle the leeks with olive oil. About a tablespoon or so for every couple of leeks will do the job. Then sprinkle them all with a bit of fine sea salt. Heat a gas or charcoal grill to medium-hot heat—you should be able to hold your hand about an inch over the cooking grate for 3 to 4 seconds before pulling it away. Set the leeks, cut side down, on the grill. Cover and cook until grill marks form, about 5 minutes. Turn the leeks over and cook until the leeks are tender and grill marks form, about 5 more minutes. Serve the grilled leeks on their own, with a spritz of lemon, or with a bit of aioli or romanesco splattered on top.